Substance use and related addictive disorders rate amongst the top four risk factors contributing to the global burden of disease and form an increasingly important part of medical and healthcare practice. Substance use disorders can cause, mimic, underlie or complicate a large number of common medical and psychiatric disorders. Making a correct diagnosis of the substance use disorder can facilitate clinical diagnosis, avoid unnecessary tests, shorten the hospital stay and make the clinician's and patient's life easier and safer. 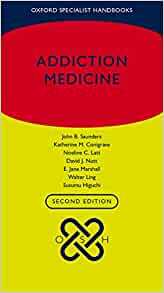 Edited by a global team of addiction specialists from multiple disciplines, Addiction Medicine, Second edition contains everything you need to know to assist in the assessment, diagnosis and clinical management of patients with substance use and related addictive disorders.